There is one thing that upsets me everytime I listen to talk radio (one thing?). The hosts are always putting down “mainstream media,” A.K.A, the newspaper. They do this while obviously quoting from their local newspaper in order to get the facts for their story. Local radio shows don’t have the money to staff a large research or investigative department, so they let the mainstreamers do the work. As for myself, I couldn’t face the day without my Los Angeles Times. The headline above is from a story I read in this morning’s edition (March 7, 2008). It was written by Times Staff Writer Seema Mehta, and is about a new form of human tantalizer, the “Cyberbully.” The meanie who posts bully-like comments on the Internet. This article rang a bell in my head (a very loud bell). I had just posted a new blog which mentioned one of my earlier shows, Lloyd Thaxton’s Record Shop. And I posted a picture of me interviewing Stan Freberg. The next day after my posting went up, I got my first cyberbully comment. A great post and a lesson for the ages. 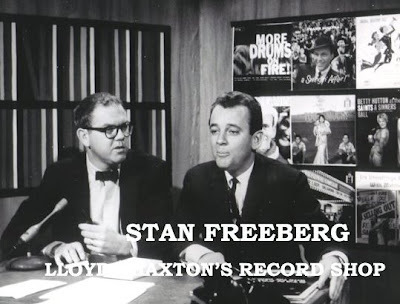 If you could only spell Stan Freberg's name, it would be perfect. Now, I’m not really serious about calling this anonymous person a cyberbully. However, the use of the pseudonym “anonymous” could have been a really big mistake. The second I saw this comment, I flashed back 43 years to another such subtle attack. It was 1965 and I had decided to change my show’s theme song, So What by Bill Black and his combo. I asked my friend Herb Alpert if he would record a new one for me. Being the great guy he is, Herb never missed a beat. The next day he was in the recording studio and the new theme, So What’s New, was born. When I received the “Stan Freeberg-Stan Freberg” cyberbully comment, I asked Dan Schaarschmidt, Research Video’s ace video editor, to dig into my show archives and find the famous Herb Alpert end-credit. Remember this? This credit was posted after every show for six months. That is until we got a letter from a listener (TV bully?) who wrote and said …. What? Take a closer read. What’s wrong with this picture? You got it. We spelled Herb Alpert’s name wrong. For six months (180 shows) we didn’t hear one complaint. That is until our TV bully (a woman fan) called and informed us of our mistake. We were, to put it mildly, extremely flabbergasted. However, we bounced back and decided to make a big deal out of it. We invited our bully viewer to join us on the very next show. Then we told a lie (albeit, a tongue-in-cheek kind of lie). We told her it had been a contest all along and that she, being the first one to catch the mistake, had won a TV set. We presented the prize amidst much applause, corrected our mistake, and the beat went on. There’s no Business like Show Business!! That’s why I said that the bully who posted the Stan Freberg-Stan Freeberg comment made a big mistake. By using “anonymous” as their moniker, there is no way I can respond. Think about it. There was always the chance that I was having another contest and that maybe an iPhone, or an iPod, or a plasma HD TV might have been the prize for discovery. Suggestion: next time anyone wants to be a cyberbully on this blog, add your email address and use the name “anonymouse” instead of “anonymous. “That way I will know you are a Mouse Cliquer and eligible for any prizes that just might be for the taking. No more lies. I loved the comment. It made me smile. I downloaded Herb's Taste Of Honey. After 40 years, his music is electrifying. Hey for years when I went into the record store and requested an Herb AlPert recording ... I would ask for Herb AlBert ... and not one ever corrected me at the store. Then one day I look at the label and noticed ... DUH it was AL PERT... Not BERT... shows ya how close I pay attention to stuff. And since I've brought up the topic of not paying attention... 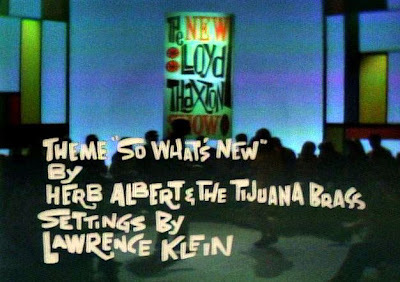 I do remember talking about themes from shows that Lloyd has done over the years... An ABC daytime game show called FUNNY YOU SHOULD ASK... the close theme was discussed with Earl I think... and it turned out that the name of that theme was something called SHADES ... How here's the part I don't remember ... was it JUST "SHADES" or was it "SHADES something something... And who was it by. I have a copy of the theme but the original title isn't on it... I just named the file when I got it the with the name of the person that sent it to me. EARL ... was that person. So with all that said ... one more item... Stan Freberg is a very funny person show enjoys humor of all kinds... HAD he seen this ... I sure he would be smiling at the mistake too. Pointing out faults in others is not my bag... When people MIS-pronounce MY name and I answer to it as if they said it right... Drives my wife nuts... But what the heck... we're only on this planet for so long... there isn't enough time to sweat the small stuff... you know what I mean? Since I'm gettin' up to an age when the clocked could tic for the last time for me any day now... SOOOOO! ! ! Uncle Lloyd could we give us an E.T.A. as to when the DVD will arrive? I want to be around to enjoy it and the memories it'll bring. PS I post using the annomouse Because I have forgotten what the heck my password was or the screen name I used... SEE what I mean about the memory thing?? It's going fast. P.S.S. Point taken here.... I should have proof read by posting a little better.... there are a lot of ... well lets just say MY pea brain runs faster than I can type. So when you read the above posting... just put in the right words in your mind... and pretend I did it right. I loved how you turned around the 'mean' comment and made it a positive! I am looking forward to seeing your DVD. I hope you've been able to include all the musicians you wanted. I saw a clip on YouTube of the Shangri-las and I saw a curious thing, maybe you could tell what it is. After your intro the camera cuts to black and what looks like a wipe to the singers on stage...maybe it's the old dub but it looks like a MECHANICAL wipe, almost like something is attached to the front of the camera(?) Maybe I'm seein' things. So it'll be great to see a lot of your show I never got to see. I watched from the Oregon Coast to KPTV in POrtland and they only carried your show for two years! Two great years to be sure 64-65, but I'd like to see the rest! Lloyd, I remember the days when you'd do your bit with a sax or a Hammond organ. You were cutting edge cool. Be well and Be safe. Please, Please, Please release the 1964 episode with Roger Miller where he does Chug-A-Lug! Please, Please, Pretty Please! P.S - if you wanted to send me a copy of just him that'd be acceptable also. Love your blog and can't wait to watch your show! Keep us posted! Lloyd...I'm the guy who posted the Freberg/Freeberg comment...I'm the guy you're calling a "cyberbully." I like and respect you but I think you're off-base here. First off, it was largely a positive comment. I was complimenting you on what was otherwise a great, wise bit of writing. Thirdly, the word "bully" suggests someone who uses their size or power to make someone less powerful do something they don't want to do. But I have no power. And what am I trying to make you do that you dont want to? Spell Stan Freberg's name right? Oh, what an awful thing. "He's such a bully! He once pointed out a spelling error I made!" Lastly, you say I made a mistake by being anonymous because...uh, why? Because if I wasn't, you might have invited me onto a TV show you don't have now and given me a TV set? I might suggest you made a mistake by setting up your blog without a private e-mail address so that I could have sent my message that way. I may be anonymous but you seem to be unreachable except through this public forum. So you basically forced me to either make my comment in public or not at all. I was and will always be a big Lloyd Thaxton fan. I watched you darn near every day and if I weren't the clumsiest kid in Los Angeles, I would have been on your show dancing and lip-syncing in the sixties. But I think you're wrong to, instead of just apologizing to Stan and moving on, trying to make an issue of someone else's actions and call that person a "mean cyberbully." What's so mean about pointing out a typo? PLEASE!! I hope you were smiling when you rote that. I was kiding. I mis-tiped Stan's name. You caught it. Thank you. No nede to apologize to Stan. Knowing him, I know HE was smeiling. Hope all is well. What's the latest on the DVD? We're all anxiously awating the release. Looking forward to the Lip Synch songs! I just discovered the site through the Fryman Canyon site (I'm a neighbor). I'm embarrassed to say that I've never heard of you. However, my husband who is a bit older and very much into tv, LOVES you. He was excited to hear you live in the neighborhood. You have a way of writing that is engaging, witty, and your personality really comes through. I'm now a fan! What ever health issues you have/had, I hope they resolve and I'll continue to read your blog! PS. I'm going to use your fabulous tip on pointing out random houses on my next out-of-town-guest "celebrity home tour"! Why didn't I think of that??") You're hilarious!